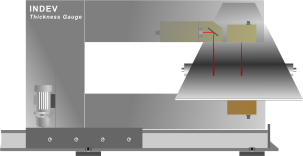 The INC-100 is intended to measure at a specific strip position (mostly at the center). It can be equipped additionally with a speed and length measurement sensor. The measuring head is positioned with a frequency-controlled AC motor. Hydraulic and pneumatic drives are optionally available. The INC-200 is intended to measure in scanning mode or at a specific strip positions. It is equipped with edge detection sensors. The measuring head is positioned by a frequency-controlled AC motor. The viewable cross profile resolution of 1 mm and the synchronization of the sensor signals with the head position encoder signal ensure excellent precision. 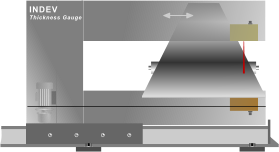 The INC-300 is intended to measure at specific strip positions. It can be equipped with up to three measuring heads. 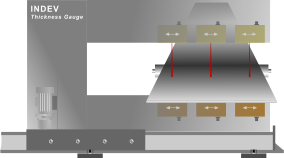 The measuring heads are positioned with linear guides. Laser pointer with visible beam simplifies the positioning. The C-frame is positioned with a frequency-controlled AC motor.